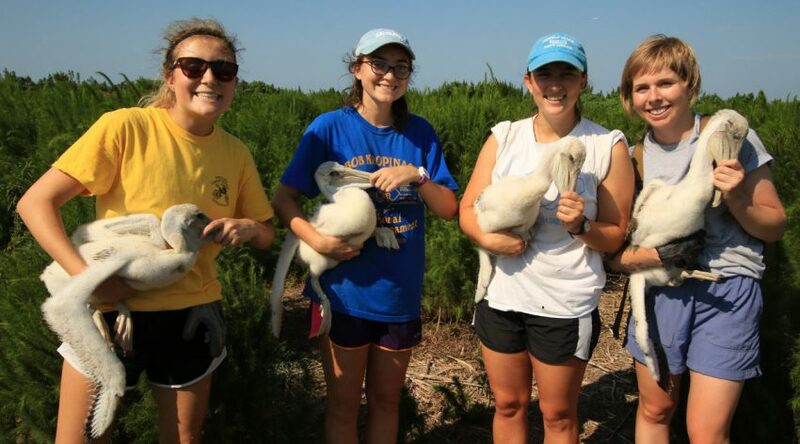 The 2016 interns at a pelican banding on New Dump Island. Pictured from left to right: Kat Vayda, Maddie Fisher, Alison Andrews, Ginny Crothers. When this year’s four Coastal Advocacy Institute interns started at the North Carolina Coastal Federation, they had no idea just how much they would accomplish in a short time. Throughout the course of the summer, they helped write comment letters, worked on a website about living shorelines and participated in field activities along the central coast. “It’s been cool to experience all the different aspects of the federation in an internship. You never get the same amount of responsibility as we did this summer,” said intern Alison Andrews. Working together, the interns researched and wrote two comment letters that were submitted to the Army Corps of Engineers. The first was written on the proposed terminal groin on Figure Eight Island near Rich Inlet. The second was on the changes to the Corps’ nationwide living shorelines permit. They also wrote a comment letter on the proposed terminal groin at Ocean Isle Beach. The interns also met with several scientists and professionals working in environmental fields and helped plan the visit from Russian environmentalists in June. Outside of the office, they got to get their hands dirty, working on cleanups and restoration projects in Pine Knoll Shores, Jones Island, the Rachel Carson Reserve and other locations. One of the most memorable experiences, they said, was the pelican banding at New Dump Island in the Core Sound. Friday is the last day for the interns, who will graduate from the Coastal Advocacy Institute on Saturday at the Pelican Awards. Read below to learn about the interns’ views on their experience and what’s next for each of them. Andrews said her favorite part of the internship was getting to work both in the field and on policy. “I feel like I made a difference during this three-month internship, which you don’t get often,” she said. The most surprising part of the internship, she said, was the scope of the federation’s work — the advocacy, restoration and outreach. Andrews will finish her senior year at the University of North Carolina at Chapel Hill, where she is studying economics and public policy. She is considering pursuing a career in environmental law. 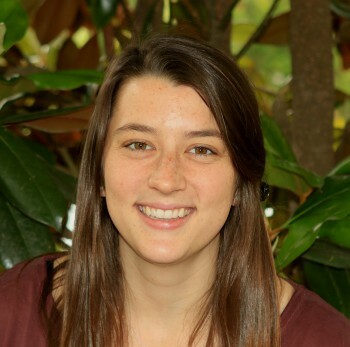 Crothers applied for the internship after hearing positive reviews from others at the Nicholas School for the Environment at Duke University, where she is in graduate school. Her favorite part of the internship, she said, is that it was a combination of things. Crothers said initially she had thought about going abroad this summer, but she realized she felt she invested in North Carolina. Crothers will be in Beaufort for the fall, where she is taking classes at the Duke Marine Lab. 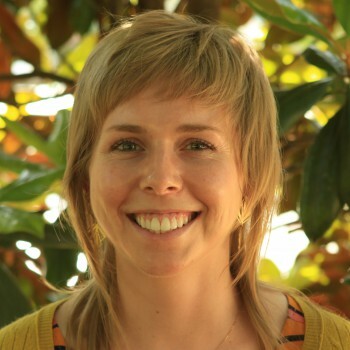 Fisher is from the coast, which is what initially sparked her interest in the internship. She said she’s enjoyed the field work the most and learned a lot about policy. “Learning about the living shorelines project as a whole has been, probably, the most interesting because we’ve kind of been a part of every process,” she said. Fisher said pelican banding was the one of her favorite experiences. Fisher returns to the University of North Carolina at Chapel Hill for her junior year. She is majoring in environmental science and music. 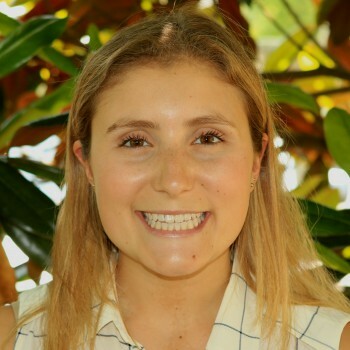 Kat Vayda, a Minnesota native, learned a lot about the North Carolina coast during her time at the internship — and she felt like the interns’ work really accomplished something. Vayda said her favorite projects were writing the comment letters, as they took up a lot of time and research, as well as because she learned a lot from working on them. 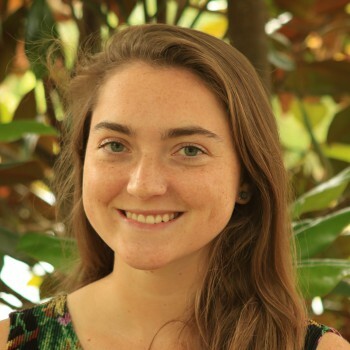 She is a rising senior Duke University, where she is majoring in environmental science. Vayda is also considering a career in environmental law.